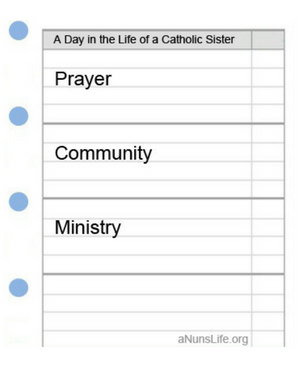 What's a day in the life of a Catholic sister or nun? This is a tough question to answer because Catholic sisters and nuns have such a variety of lifestyles, ministries, and callings! Each community has its own distinctive personality and flavor. No two communities -- indeed no two nuns -- are the same! Sometimes we envision sisters living a highly ordered life that is unchanging in structure and monotonous in content. But in reality, while there may be some regular customs and practices, a day in the life of a Catholic sister and nun can be quite varied -- especially when the Holy Spirit is in charge! Prayer. God is the center of our life as sisters (indeed this is true of all people of faith)! We tend to this relationship as the most precious in our life and find that all of our other relationships flow in and through this central love of God. As Catholic Christians, our faith springs forth from a love of Jesus the Christ and a desire to allow the Gospel to permeate fully our life. Daily prayer for sisters and nuns may be focused at regular times throughout the day. Prayer may be something we consciously tend to in the midst of our work and interactions and experiences. Prayer includes the Sunday Eucharistic celebration and may also include other liturgies and common prayer services. We pray in solitude and with our sisters, parishes, local communities, and others. Prayer may be reflective reading, absolute silence, singing, painting, building, running. Prayer may reflect the tradition and charism of our communities' founders and early sisters. Prayer may be formulaic or freeform. In whatever ways we pray, we open ourselves to God and share our cares and concerns, joys and sorrows with our Compassionate God. Community. "Will you in all things take your sisters into account?" As I was discerning the call to religious life, one of my nuns told me that this was one of the questions that she was asked many years ago as she prepared to enter the community. I love it because it has given shape to how I understand the vow of obedience in particular and my life as a sister in general. We take the "common good" very seriously and make each and every decision in light of how it affects our sisters and how it affects the mission God has entrusted to us. Religious life is not a group of individuals, though indeed we are each individuals. Religious life is not a interest-based group, though indeed we have a common mission. Catholic sisters and nuns are part of a sisterhood both within our communities and among our communities. We live and move and have our being with one another. This central notion of community can be expressed in many different ways -- praying together, working towards a common goal together, living together, sharing meals together, sharing the same bank account! In any given day, you will find a sister's life intimately connected with the life of her sisters. Ministry. Our relationship with God and our relationships in community compel us in our outreach to and with others. In turn, our experiences in ministry enrich all that we are. Sisters and nuns minister in a myriad of ways -- basically wherever there is need and wherever God is calling. Ministry ranges from holding the suffering of the world in deep prayer to digging wells for improved access to safe water to a tender presence for someone in need. We may hold jobs that are in parishes, schools, hospitals, universities, NGOs and nonprofits, clinics, civic organizations, and pretty much anywhere. We may not be employed in the conventional sense but nonetheless work tirelessly on behalf of others through advocacy, education, inspiration, sacrifice, healing, mindfulness, hospitality, and so many other ways. Each sister or nun will always have a slightly different way of describing her daily ministry! Next time you wonder about the daily life of a Catholic sister or nun, look for these three common elements -- prayer, community, and ministry -- and see the unique ways each community and person is living God's call!